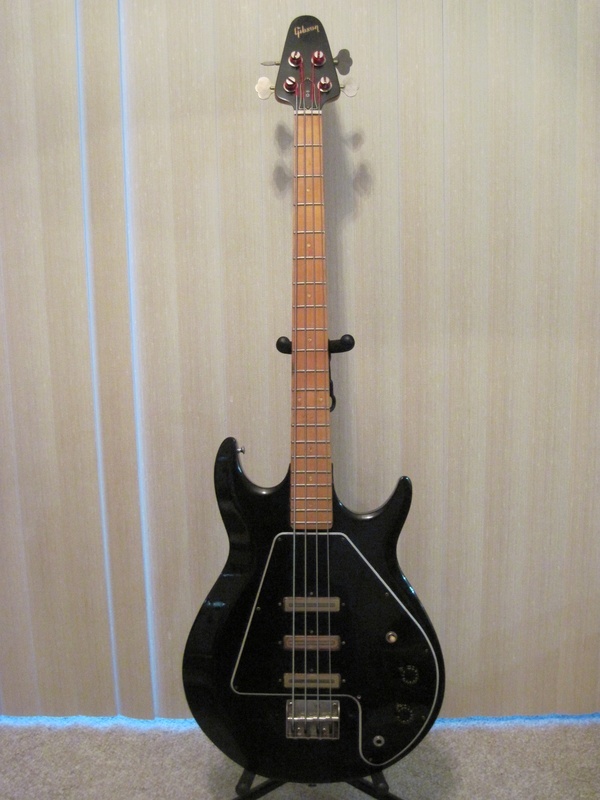 1976 Gibson Grabber G-3 Bass Guitar One of my favorite basses ever. The Gibson G-3 was a bass guitar introduced in 1975 by Gibson building on the design of the Gibson Grabber. Introduced in 1975 as a companion to the Gibson Grabber, the G-3 (which stands for Grabber 3) introduced a new pickup scheme to the already established body style. Instead of a sliding pickup as was present in the Grabber, the G-3 featured a so-called "buck-and-a-half" trio of single coils. Along with a tone and volume control, the G-3 featured a three-way switch linked in with three Bill Lawrence single coil pickups. In the up position, the neck and middle pickups would be activated, and a humbucker effect would result. Likewise, in the down position, the middle and treble pickups would be activated similarly. However, when switched to the middle position, all three pickups would be activated, the neck and treble pickups being in phase while the middle would be reverse wound, hence the term "buck-and-a-half". There were 3 versions of the G-3. This is the first....which has the epoxy dipped pickups in which you can see the coil windings etc. They had the HUGE, clover leaf tuners and a Nickel bridge cover. Version 2 started in 1978 with the black covered pickups (same Bill Lawrence Pickups....all else was the same. The last version came with the black covered pickups, they ditched the bridge cover, put on smaller tuners and started using modern colors and walnut on the ENTIRE bass in some versions, Ebony or Rosewood fingerboards also emerged. They just went wild with them before the move to Nashville. Hi there, You've performed an incredible job. I will definitely digg it and individually suggest to my friends. I am sure they will be benefited from this site.